First time owning a Jeep and LOVE it. She's my baby. Looking forward to gaining some new friends! Adam, Long Island for home, New Paltz for school, NY. 93 XJ.. 3", 33s, lots of other little things. Its almost done. I'm James, I'm from Beaver PA and I have a 92 xj 4.5RE lift with 30"mtr's soon to be 33tsl's. I think you're looking for the southeast section. According to the neighborhood map, unless your location is wrong or something. i know im a little out of the map but holy crap. Quakertown , Pa., hour north of philly and half hour south of allentown. 1987 xj limited, no lift, Nearly bone stock motor/trans setup. Looking to get a lift in it soon and some rubber to help with footing. Home built safari Rack on the drawing board along with front and rear bumpers. But that has to wait until I replace the Burnt out trans in my ram 2500... Damb jeep saved my **** again..
My name is Phil I live in Hollidaysburg, PA. 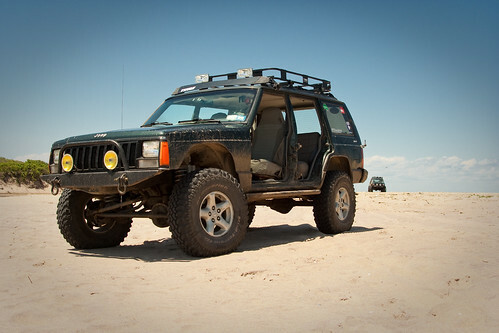 I have a 90 jeep cherokee laredo stock height with 29" tsl's. i kinda figured he meant the TN guy. so do you wheel in the northeast?? I don't mean to sound like a jerk but, Michigan is located in the great lakes area. You can stay here if you like, just pointing it out. I don't know jackabout the map, but I'm Lavern from South Jersey by the shore. Had a Blazer, sold it and am picking up a 88 Cherokee Limited 2dr on Monday.